See those beauties? 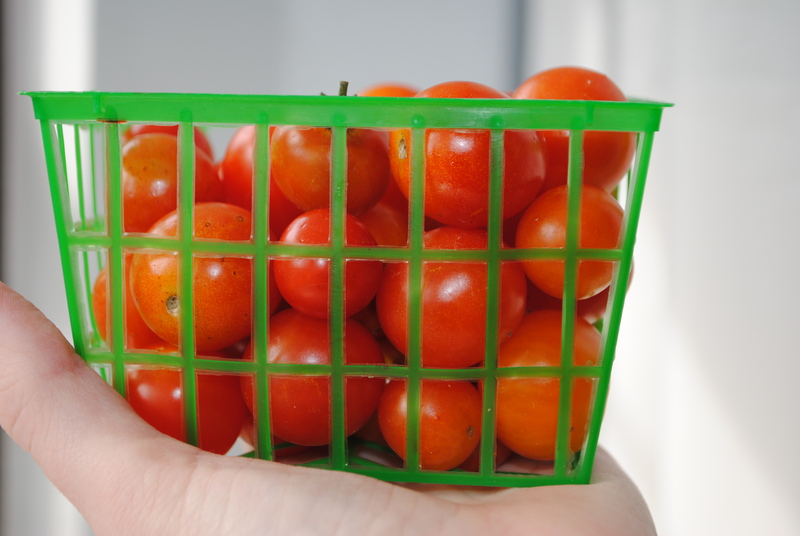 Real, honest-to-goodness, locally grown cherry tomatoes. In January no less. For a northerner like me, these tomatoes are nothing short of miraculous. I keep going back for another. They appeared in our salad last night, and I’m anxiously awaiting a taste in my lunch salad any moment now. As soon as my hubby brings it to me. Ahh…love. The Farmers Market in our town is brand new. The little ones and I headed over on Saturday morning. We bought a big cup of squeezed-right-before-our-eyes orange juice for $1, this basket of tomatoes, a loaf of chocolate bread, and a loaf of banana bread. We drank the juice on the spot. The breads disappeared by Sunday morning, and the tomatoes are quickly being eaten. The boys loved the market. They especially enjoyed nibbling all the free samples and running into many friends. You know, I am so surprised by how many people we run into on an almost daily basis. So many familiar, friendly faces. I can’t decide if this is the product of a small town, a large church, or something else. I don’t know, but I’m not going to question the blessing. You are! Seeing people that we are getting to know helps us feel more comfortable here.